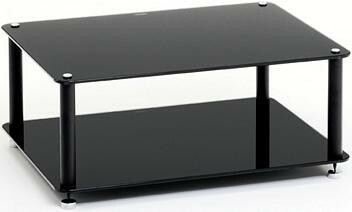 Amazingly good value for money, this 2-shelf hi-fi stand comes in a choice of glass and frame options. Also available as a 3 shelf stand and 4 shelf stand. Bargain! Earn 169 loyalty points when you order this item. 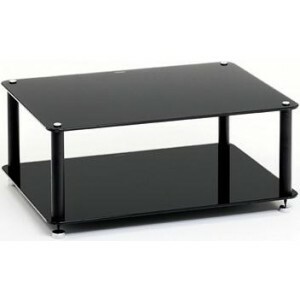 Custom Design Discrete Hi-Fi stand (2 shelf) has a unique minimal, clean edge design that offers discreet and practical support for Hi-Fi or AV equipment - available in clear or piano black glass. 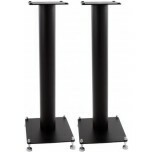 This is a 2 shelf version of this stand - additional shelves may be added later as required. 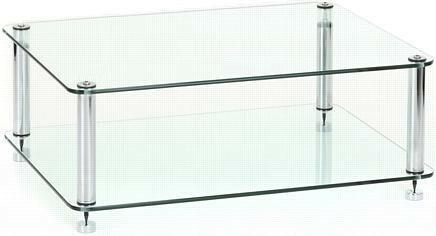 We also sell 3 shelf and 4 shelf versions separately. The image shows the old model with spike feet, these are now supplied with rubber feet.